Cardinals (Cardinalis cardinalis) -- or northern cardinals -- are small, yet striking songbirds found across North America. Their population is doing well and they're noted as a species of least concern on the International Union for Conservation of Nature's Red List. Certain adaptations allow them not only to survive, but to thrive in their environment. When you think of cardinals, you probably imagine their bold red plumage. However, only the males of the species have this kind of coloring, whereas the females are light brown or green-brown with only a slight hint of dark red. Females have what is known as cryptic coloration -- plumage that allows them to camouflage themselves in their surroundings and potentially avoid predation. Although males don't have this advantage, their coloring is useful to the survival of the species. They use their bright plumage to attract females to mate with, hence carrying on their bloodlines. Since cardinals are primarily seed eaters -- although their do also eat fruits and insects -- they have specially adapted beaks to help them with their diet. Their short, thick and conical beaks allow them to easily crack seeds, getting through the husk and allowing them access to the nutritious meat inside. 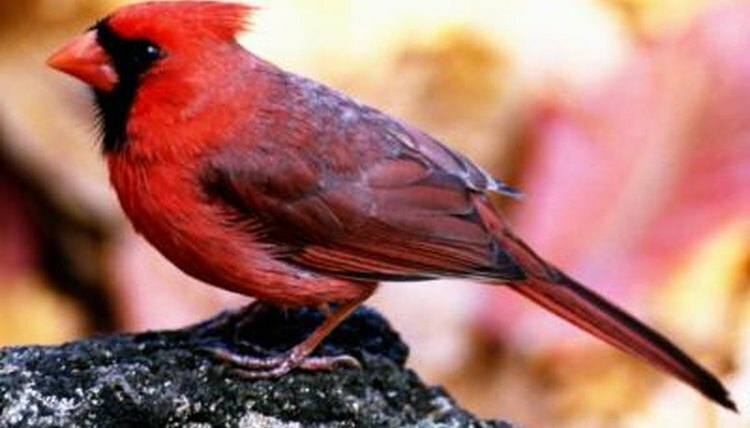 Cardinals have a large range, spanning much of the United States, southern Canada, Central America and even parts of Mexico. Since the early 1800s, this species has greatly extended its range. They've adapted to this new range by taking advantage of both moderate temperatures and increased human habitation in these regions. Many people put food out at bird tables, so they've been able to adapt their feeding patterns and thrive over a larger geographical range. There are several ways in which cardinals communicate with each other to help avoid attacks from predators and other dangers. Both males and females use vocalizations that sound like short "chips" to warn each other of any impending danger. They also communicate threats using physical displays. They use many different visual cues when threatened, including tail flicks and raising and lowering their crests.